In simple words, Generics are that type of classes which has PlaceHolder instead of datatypes. When you create generic classes you don’t specify its data type; datatypes are defined when you create objects. This makes Generic classes reusable and type-safe and your Generic classes and methods are able to work with any datatypes. Generics improves code usability, type safety and performance. Mostly Generics are used for creating collection classes. You can use Generics by adding System.Collections.Generic namespace. Here, I have written the very simple program and hope you will understand it very easily. In the above program, I have created a Generic class GenClass which has a placeholder. 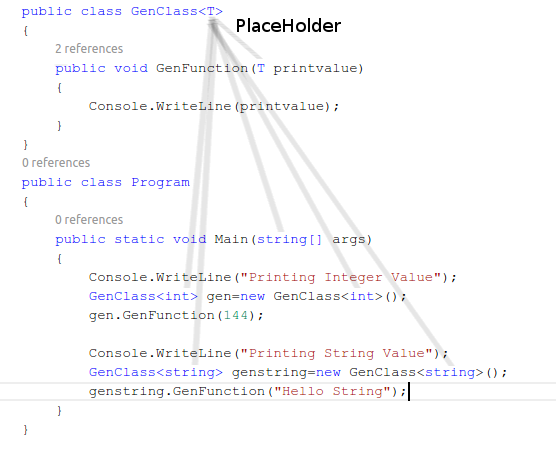 This class also has a method GetFunction that accepts a T type parameter and prints on the console. is a placeholder that is replaced by datatype when created objects. In this chapter, you learned What are Generics in C# Programming, Its benefit, and complete programming example.